What if the young pioneers of the First Aliyah had yielded to the pressure their elders mounted against them: Do not annoy the Turkish authorities! Do not aggravate the Arab neighbors! Do not irritate the European powers! What if the pioneers had traded the future of Jewish settlement in Eretz Yisrael, a future of peace, for “peace now?” They would have returned to the bosoms of their families in Russia, Poland, Rumania and Hungary. They would have returned to their studies at universities, to their lucrative jobs. And the land of Eretz Yisrael would have lain fallow under the camel hooves of Arab Bedouins. The Jewish State would have remained a distant dream perhaps for another fifty generations. A dream not to be realized as long as caution and cowardice prevailed over courage and self-sacrifice. The young pioneers of the First Aliyah did not opt for “peace now.” They opted to settle and cultivate the Land of Israel, to build Jewish institutions, to revive the ancient Hebrew tongue and bring about a renaissance of the Jewish nation. And this they accomplished. The cultured and beautiful Mrs. Pines soon turned her home into a meeting place for rabbis, teachers and newly arrived young Zionists from all walks of life. She became a role model for the young women of the Yishuv and they flocked to her circle, eager to volunteer their services for her various social projects. In 1905, Haya “Tzippa,” as she was affectionately called, organized the volunteers into the Ezrat Nashim Association providing medical care and economic assistance for needy women from maternity to old age. Within the framework of Ezrat Nashim, the “Linat Tzedek” Fund was set up to dispense nursing care and free medication for thousands. The dynamic Mrs. Pines succeeded in enlisting the leading ladies of the Yishuv, among them Baroness Ada Rothschild, Rebbetzin Matil Berlin and the wife of Zeev Yaavetz to join her in her efforts to establish a treatment center for mental disorders, primarily of women. With a contribution from her own father, Haya Tzippa bought land in Givat Shaul, and in 1912, the first building of the now-famous Ezrat Nashim Institute was dedicated. A year later, a second building, for male patients, was erected through the untiring work of Haya Tzippa’s group. In the United States and Europe Ezrat Nashim support groups were formed, and with their help the Ezrat Nashim Institute grew into the country’s major facility for the treatment of mental disorders. Rebbetzin Pines’ interest in the welfare of women extended to other areas as well. 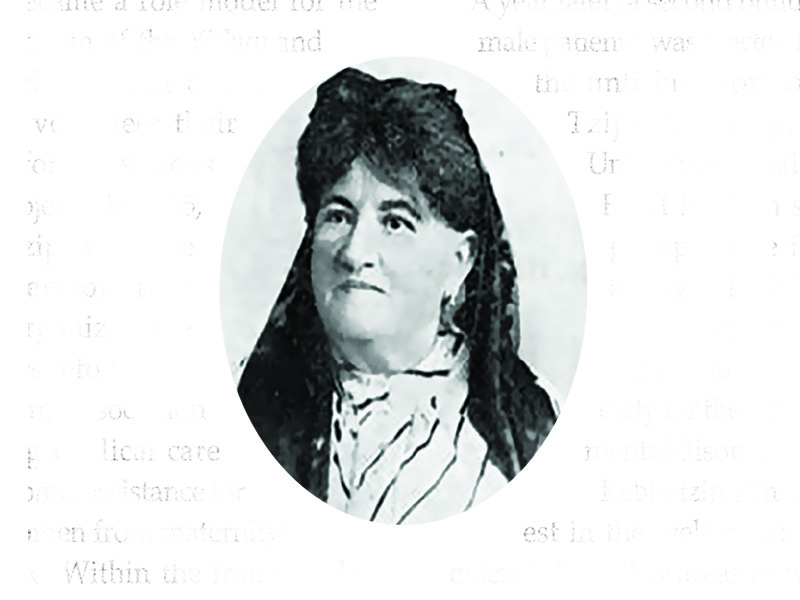 For young girls, whether new arrivals in the country without families or daughters of long-established settlers unprepared for the challenges of the new era, she set up a string of workshops. In these workshops, in addition to sewing and knitting, the girls received instruction in Hebrew, Jewish studies, mathematics and other practical subjects. Next articleSpice up your Vacation in Israel!